As a labor leader, civil rights activist and grassroots community organizer, Christine Chavez has fought for some of the most critical social issues of our time. She is the granddaughter of Cesar Chavez, who founded the United Farm Workers in 1962. 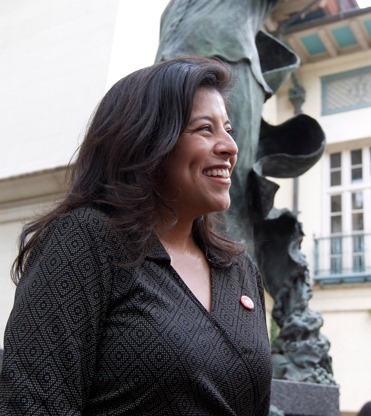 Chavez serves as farmworker coordinator for the U.S. Department of Agriculture, a job which she brings instant name recognition as well as a wealth of experience. Christine Chavez at the unveiling of a statue honoring the legacy of her grandfather, Cesar Chavez, at the University of Texas at Austin. When you reflect on your grandfather’s legacy, what comes to mind? My grandfather’s legacy has been about what he gave to other people. It always amazes me how many different people he inspired. Whether I’m in Texas or New York or Florida, people come up to me and tell me that they got involved in some sort of activism because of what they saw, heard or learned about the farmworkers movement. What’s the biggest issue regarding farmworkers and Latino immigrant laborers these days? Immigration reform continues to be a huge issue. Some people say that as much as 80 percent of the people who put food on our tables don’t have the necessary documentation to be in this country. It’s an open secret among those who hire these workers and the consumers who benefit from their labor. Yet nobody really wants to do anything to address the matter. What inspires your civil rights activism? I’m inspired by all the people I’ve met and worked with in the farmworkers movement. And there are some amazing activists on the periphery of the movement as well as outside it who also inspire me. These people enable me to look deeper within and challenge myself to get out there and speak out for the rights of others. How does the United Farm Workers champion the rights of California’s farmworkers? The board members of the UFW are out there every single day, pressing for reform. Our cofounder, Dolores Huerta, and our president, Arturo Rodriguez, constantly put their necks on the line for farmworkers. How are you able to leverage the foundation your grandfather’s work laid to further your civil rights activism? A lot of people come to me and my cousins for help in furthering their cause—and if being arrested with them or being seen in a news photo with us helps them get some press, then of course we’re going to do that. I think my grandfather would probably be upset if my cousins and I chose to not do anything and sit on our hands. How do you serve the interests of farmworkers in your position at the Department of Agriculture? There are so many different programs that the department has for farmworkers, whether it’s grants for people trying to get into farming or providing technical assistance to farmers. We also have a number of internship, housing and nutrition services programs for students. We go around the country, explaining to farmworkers how these programs work and what their benefits are. Two years ago, in conjunction with the U.S. Department of Labor and the U.S. Department of Education, we brought more than 100 farmworker women to learn about all our services.